We trawl Charlotte Square looking for a good spot, Daughter and I. 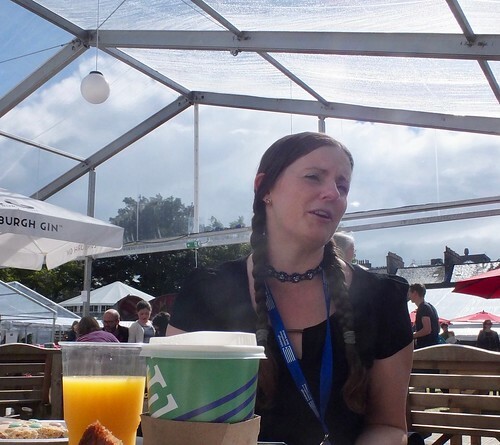 In case it rains we want shelter, and if it doesn’t, we’d prefer to sit on dry chairs, and I forgot to bring a towel… We’re meeting Claire McFall to talk about her new book, and to find out quite how rich she is. Well, not really. A bit, maybe. After all, discretion is my middle name. 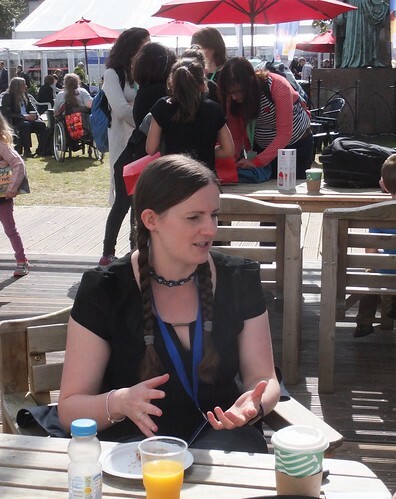 Anyway, we manage to insinuate ourselves onto one end of a table outside the big signing tent, and I go to see if I can find Claire, while Daughter ‘holds on’ to three chairs. 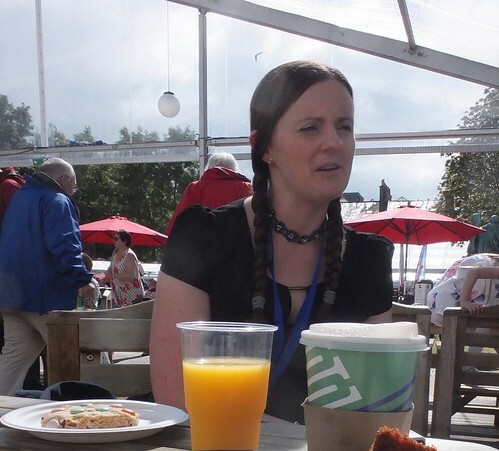 I’ve checked online what Claire looks like, and apart from the fact that she has plaited her hair, I know it’s her when I see her across the box office tent. Claire has been told to look for a short fat grey witch, but she’s obviously far too polite to say that she can tell I must be me. 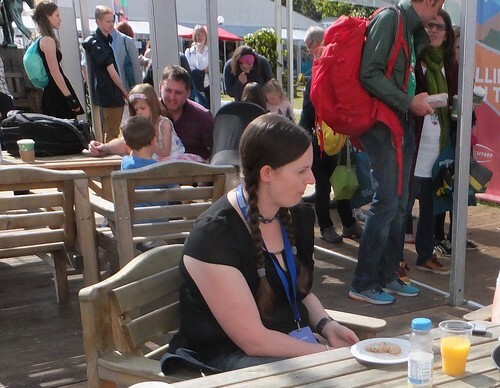 We walk over to the signing café and Daughter goes in search of something to feed Claire. We talk about Claire’s morning event in the Spiegeltent, and then Daughter returns with the requested orange juice and a Smartie cookie, which I fear might be suggesting Claire looks like a teenager, but she accepts with grace, admitting to being a bit juvenile. 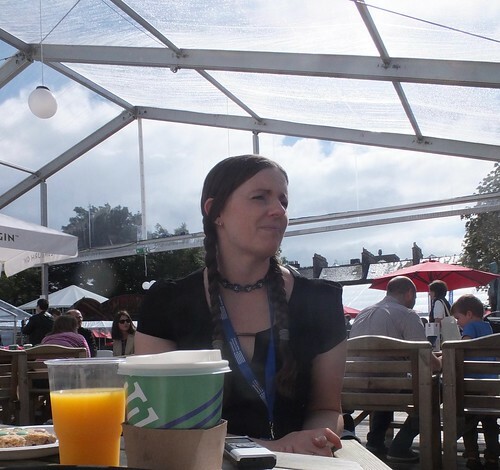 She doesn’t come to Charlotte Square that much, because it’s some distance away from her home in the Borders, but this is her third time at the book festival [as an author]. She’s doing an event with Martin Stewart later in the day; both teachers, both with novels about death and crossing to the other side. 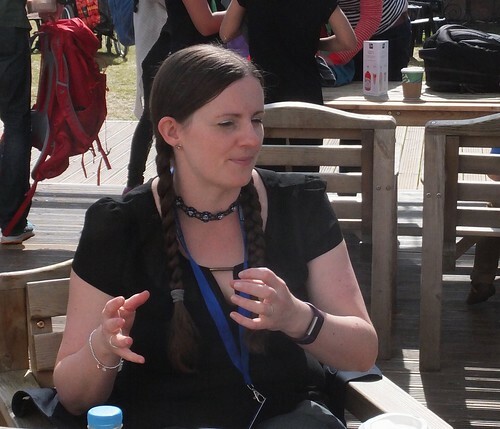 It’s odd how the festival organisers can always find authors and books that share themes. So, I’m here to talk money… and I dive in with my comment – question, really – about whether or not Claire is rich. She laughs, ‘I’m not really rich. The China market has opened up a lot more opportunities for us. Unless you are a super star in the UK it’s really hard. Apparently the average is £11,000, which is not enough to live on. Accompanied by loud singing by Malcolm Donaldson next to us – singing to fans waiting for his wife Julia to sign their books – I ask if Claire has any idea how the Chinese market found Ferryman. Accompanied by ever more rousing guitar music from Malcolm Donaldson, I ask if Claire had started on this before the Chinese discovered Ferryman. We talk about how Claire will say they are going to write a story, and there’s a whole chorus of “uuhhh” and she tells them “this is the best thing we’re going to do all year!!! We’ll be analysing poetry next week, and then you’ll be sorry.”‘ We laugh. ‘Well, it’s only a tragedy,’ I say. I enquire whether it worries Claire when nosy interviewers just want to know about her Chinese money. Claire mentions that evening’s event, which will be chaired by Lari Don. She has read Mind Blind, and will want it signed. ‘Fan-girling,’ she calls it. We talk about the advantages of having a chair, and how at school events children can be too shy, and she says if they don’t ask questions, she will threaten to ‘just keep talking. “I can talk all day,” and all of a sudden they won’t shut up.’ Claire laughs. I say I’ve been trying to place where the train accident [in Ferryman] takes place. Somehow we stray back to the Chinese money again. And Malcolm Donaldson is still singing behind me. ‘The Chinese royalties have put me into a different ball park. My husband and I were still living in a maisonette, in Innerleithen, wondering how we could ever afford a house. How do people do this, and we have two full professional jobs? It has meant us moving from the maisonette into a nice house, and a bit more space and freedom. I don’t have to worry about things.’ It means Claire can afford to work a two and a half day week, spending time with her son. ‘They want to be sure they are getting the author’s true words, and I think that’s why quite a few of them have branched out and tried their English by reading the original. They’ve bought into the story and they want to make sure it’s what they get.